The Long Winter and the State of Bike Lanes in Chicago. Last year I think we were all pleasantly surprised to see the City do a good job with snow and debris removal from the protected and buffered bike lanes. I was one of the early naysayers who predicted the Kinzie Cycletrack would be a good place to pile snow in the winter, and I was glad to be proven wrong. Having said that, last winter was pretty easy. This winter, however, is a different story. Now we're seeing how the City handles snow removal during a real winter. The old folks I talk to admit that the beating Chicago has taken this winter has been the worst since 1979, and it shows in the bike lanes. Some bike lanes have been maintained, while others are a mess. The pictures here were taken this morning on Lake Street just west of Damen. Not only is there a lot of ice in the bike lane, there are garbage cans blocking the bike lane the whole distance between Damen and Western. I suspect that the cans were left in this position by Streets and Sanitation only becuase there is such uniformity to their position. In the background of the top photo you can see a garbage can and taxi almost completely blocking the bike lane. I've heard people opine that at some point this winter the City just gave up on clearing the bike lanes. While I don't think they gave up, I have noticed that some bike lanes are maintained better than others. On Washington between Ashland and Halsted the bike lanes are clear, but only becuase the bike lane is on the traffic side of parked cars. The curbside is still cluttered with piles of hard packed snow and ice. As a result, many cars are parked away from the curb so that they end up obstructing the bike lane. I'd be interested to hear from anyone who is still commuting to the West Side or Oak Park. Lake Street was a street transformed by the installation of bike lanes, but I suspect the commute this winter is a rough one. 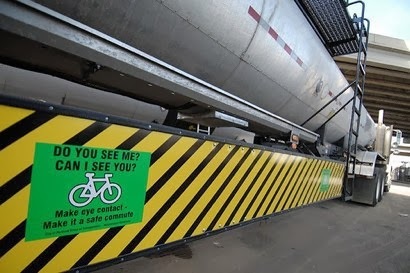 A tanker truck outfitted with a guard to protect cyclists. Right hooks are scary. They occur when a driver turns right in front of a cyclist causing a crash. Even scarier - and often deadly - are right hook crashes involving large trucks. The frighting potential exists for the cyclist to end up under the wheels of the truck. Our law firm has represented numerous bicyclists who were right hooked by a large truck. In September, 2013 one of our clients was the victim of such an incident, getting right hooked by a large tanker truck which turned right across the bicycle lane at Milwaukee and Odgen. The cyclist suffered a fractured and separated shoulder, but her injuries could have been much worse. She could have been killed. In October, 2012, one Chicago bicyclist was not so "lucky". The man in his 50s was killed in Chicago's Noble Square neighborhood when a truck driver illegally turned right in front of him at the intersection of Ashland Avenue and Augusta Boulevard. 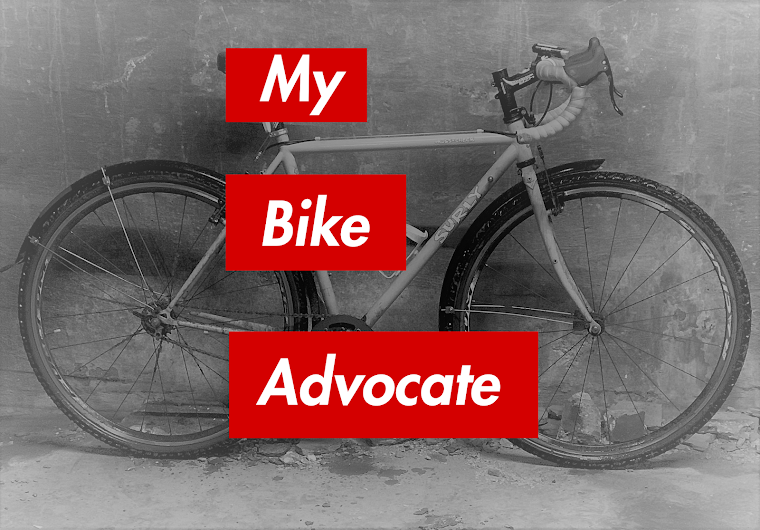 (Our firm does not represent the cyclist.) These tragedies are not unique to Chicago, and now one large city has decided to adopt aggressive measures to protect cyclists from large trucks. By the end of 2014, London will prohibit large trucks - those over 3.5 tons - from operating in the city without, "side guards to protect cyclists from being dragged under wheels, as well as mirrors to improve a driver's view of cyclists and pedestrians," according to The Guardian. The measure was proposed in the wake of the deaths of several cyclists killed in London after being swept under the wheels of large trucks. The measure will be enforced by on street checks and via closed circuit video cameras, The Guardian reports. There will reportedly be large fines for non-compliance. [P]erformance standards for side underride protection systems for single-unit trucks with gross vehicle weight ratings over 10,000 pounds. Once the performance standards . . . have been developed, require newly manufactured single-unit trucks with gross vehicle weight ratings over 10,000 pounds to be equipped with side underride protection systems meeting the performance standards. 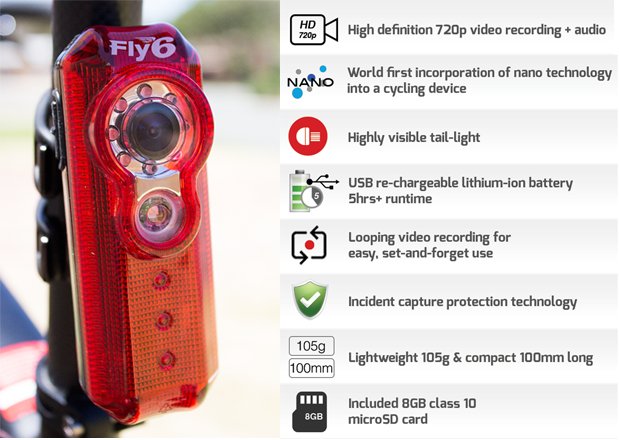 The NTSB also recommended the installation of "visibility enhancement systems to compensate for blind spots" in order to protect bicyclists and pedestrians. The recommendations came on the heels of a NTSB safety study, Crashes Involving Single-Unit Trucks that Resulted in Injuries and Deaths, which found injuries and fatalities to cyclists caused by turning heavy trucks a significant hazard. Since 1998, large trucks in the United States have been required to have rear impact guards to protect motorists in the event of a rear end collision. While some have questioned the overall effectiveness of the rear guards, there have been a reported reduction in fatalities since implementation of the requirement. Now, it is the time to take similar measures to protect bicyclists and pedestrians by requiring large trucks to be outfitted with side guards.